326 pages | 87 B/W Illus. Greenhouse control system manufacturers produce equipment and software with hundreds of settings and, while they hold training courses on how to adjust these settings, there is as yet no integrated instruction on when or why. Despite rapid growth in the greenhouse industry, growers are still faced with a multitude of variables and no unifying framework from which to choose the best option. Consolidating 30 years of research in greenhouse climate control, Optimal Control of Greenhouse Cultivation utilizes mathmatical models to incorporate the wealth of scientific knowledge into a feasible optimal control methodology for greenhouse crop cultivation. Discussing several different paradigms on greenhouse climate control, it integrates the current research into physical modeling of the greenhouse climate in response to heating, ventilation, and other control variables with the biological modeling of variables such as plant evapo-transpiration and growth. Key topics include state-space greenhouse and crop modeling needed for the design of integrated optimal controllers that exploit rather than mitigate outside weather conditions, especially sunlight, given widely different time scales. The book reviews classical rule-based and multivariable feedback controllers in comparison with the optimal hierarchical control paradigm. 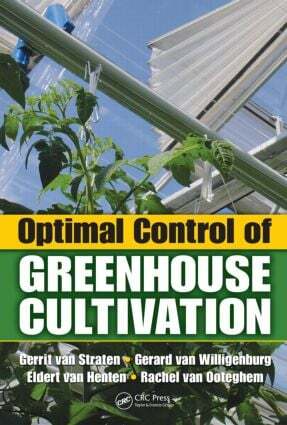 It considers real and hypothetical examples including lettuce, tomato, and solar greenhouses and examines experimental results of greenhouse climate control using optimal control software. The book concludes with a discussion of open issues as well as future perspectives and challenges. Providing a tool to automatically determine the most economical controls and settings for their operation, this much-needed book relieves growers of unnecessary control tasks, and allows them to achieve the best possible trade-off between short term savings and optimal harvest yield. How Is This Book Organized?. An Advanced Application: The Solar Greenhouse.